Dryad’s saddle, a.k.a. pheasant back mushroom, or hawks wing is a common fungus that is easy to spot starting in April. Many a morel-forager has come home with dryad’s saddle as the consolation prize when blanked on morels. English botanist and apothecary William Hudson (1730 – 1793), was the first to scientifically describe this fungus in 1778 and named it Boletus squamosus. This species was later renamed Polyporus squamosus by Swedish mycologist Elias Magnus Fries in his Systema Mycologicum of 1821. 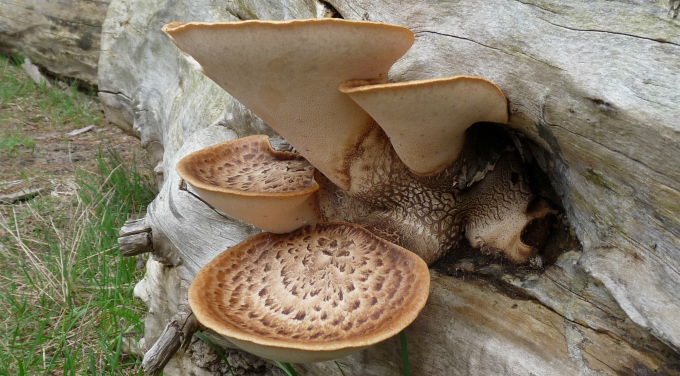 The common name dryad’s saddle goes back to the dryads of Ancient Greece. Dryads were mythical wood nymph characters in Greek mythology. Once fully grown, these fungi look like saddles. 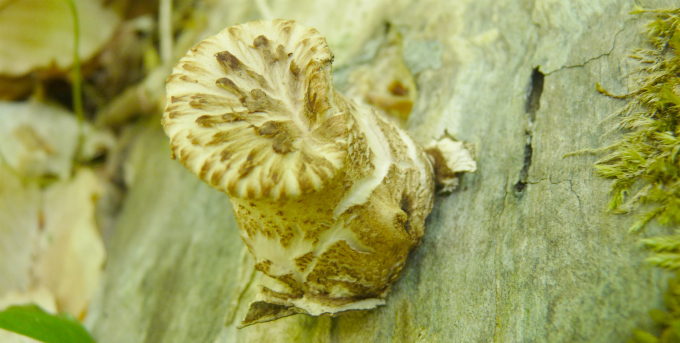 The generic name Polyporus means having many pores, and fungi in this genus have numerous tubes terminating in pores. The pores are lined with basidia that produce basidiospores. This serves to dramatically increase the surface area and thus the number of spores that can be produced. 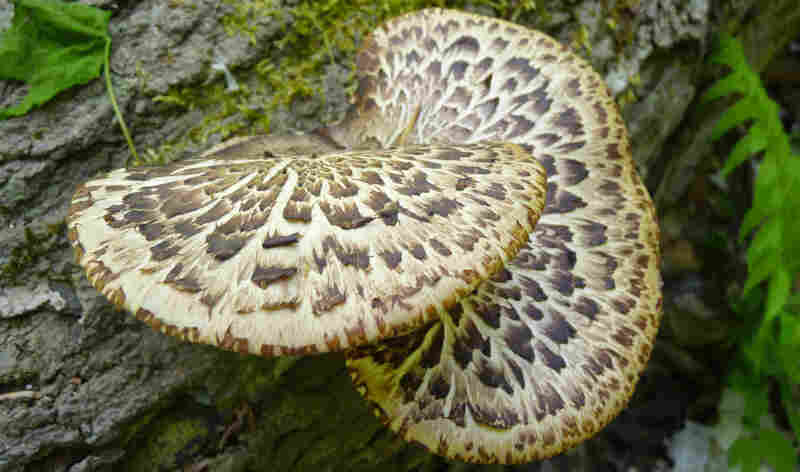 The specific epithet squamosus means scaly, and in the case of the dryad’s saddle the cap surface is magnificently patterned with large brown scales. Polyporus squamosus is a somewhat common fungus to find starting in April (depending on your location). More often than not it is easier to spot a full grown dryad’s saddle than new growth due to their size (up to 60 cm or 2’) across. They tend to stick out as shelves (or brackets) from the lower portion of dead hardwood tree trunks, or on fallen trees, especially elms. They can also emerge from the soil where a tree root is just below soil level. In these situations Polyporus squamosus takes on a very different form: a funnel. Some of these funnels are perfect horns; more often they are slightly one sided. Wet areas seem to produce more. These are found in the same places each year until the wood is consumed. Dryad’s saddle generally fruits in the spring in most areas, but there are some that fruit in the autumn depending on location. This species lives as a network of cells (mycelium) within living trees as a parasite, and dead trees as a saprobe, that digests and decomposes the wood. When ready to reproduce, the mycelium develops the bracket that emerges from the log—this is the reproductive structure. Dryad’s saddle is one of only a few decent edible fungi you will find at this time of year. The test to see if it is good for harvesting is by putting a knife through it. If it is tough to get a knife through, then it will be too “rubbery” to work with. Once you have found tender specimens, they are best when cooked right away. Like many other wild mushrooms the aroma is ephemeral often disappearing within hours. Tempura frying will retain some of this wonderful aroma as will sautéing or pan frying, or roasting. Slice them thin and cook them quickly. Overcooking will create toughness. You can also slice them thin, dry them out and eat them as crunchy chips. You can powder them as add this flour into your every day baking. You can use some of it with flour in a homemade tempura batter mix. Store fresh dryad’s saddle in the fridge but be sure to use them within two days to be on the safe side. A great way to preserve these fungi without drying it is to slice them thin and pickle them. So whether you call this dryad’s saddle, pheasant back mushroom, hawks wing or Polyporus squamosus, be sure to bring some home this spring and enjoy the wonderful aroma and taste of this incredible fungi! I’m hungry for more information on mushroom foraging. Are there any upcoming classes available? Keep watching my events page! Anything public I do is posted. I think Hawk’s Wing usually refers to Sarcodon imbricatus, a similar looking mushroom that grows in the west.